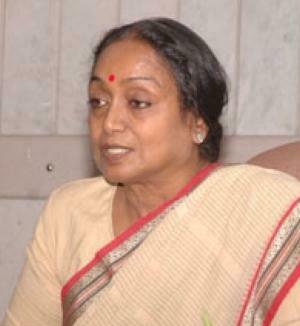 Meira Kumar,65, the MP from Sasaram in Bihar, daughter of famous Dalit politician Babu Jagjivan Ram and Indrani Devi has been elected unanimously as the 16th speaker of Loksabha. Babu Jagjivan Ram was a very senior leader of Congress for decades but was never thought of as Prime Ministerial quality as the later on fate of Arjun Singh and Pranab Mukherji. But after his death Congress adopted Meira Kumar as its Dalit face. she had already entered politics in the life time of Babu Jagjivan Ram after leaving her career as a Indian Foreign Service officer. Her arrival in politics resulted when she defeated Mayawati and Ram Vilas Paswan both in Bijnore in Uttar Pradesh in 1985. She got elected again in 1996 and 1998 from Karolbagh constituency in Delhi but got defeated in 1999. However she returned to Loksabha in 2004 when she won from Sasaram, the home constituency of her father Babu Jagjivan Ram. She was again elected this year and is one of the two Congress MPs from Bihar. She was included in the Union Cabinet but soon choosen as the Speaker of Loksabha. She is now the first woman to occupy the chair of Speaker, LokSabha and the second Bihari after Baliram Bhagat who was the speaker for the shortest duration in 1976. She did her M.A., LL.B from Delhi University and joined the Indian Foreign Service in 1973 and served at embassies in Spain, United Kingdom and Mauritius. After she entered Loksabha she was minister in the union cabinet from 2004 to 2009 as the Minister of Social Justice and Empowerment. She resigned as Union Minister for Water Resources when she was choosen for the chair of speaker by her party. Now she has been unanimously elected as the Speaker of Lok Sabha. Meira Kumar is married to a Supreme Court Lawyer Manjul Kumar and has three children, one son and two daughters. She also has won medals in rifle shooting. In the last election she had appealed to her voters in Bhojpuri.